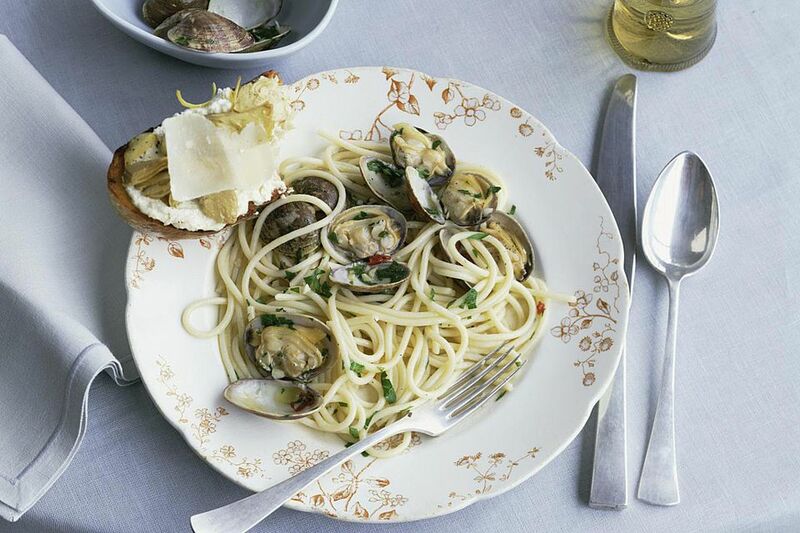 What better dish to serve at a dinner party than steaming plates of clam pasta. The sweet clams are steamed in a light broth of fresh tomatoes, onion, garlic, and white wine and served with spaghetti or linguine pasta. The ingredients in this dish are few and simple as the clams give it most of its delicious flavor. It's best to use fresh clams if possible to really take advantage of their salty sweetness. Boil some water in a large pot for the pasta. Cook the pasta according to packet instructions and have it ready around the same time as the clams or just a bit before. Soak the clams in a bowl of cold water for about 10 minutes. Drain and rinse under cold running water. Heat the oil and butter over medium heat in a large, heavy-based pot. Add the onion and fry for 2-3 minutes, stirring occasionally, until translucent. Add the garlic, chili flakes and salt and stir for about 20 seconds. Add the chopped tomatoes and fry for about 7 minutes until their juice starts to evaporate. Turn the heat up to medium-high and add the clams to the pot. Cover with a lid. After about 2-3 minutes add the wine to the pot. Cover again and shake the pot from side to side. Cook the clams for a further 5 minutes or until they open. Add the parsley and stir with a wooden spoon. Cover and shake pot again. Drain the pasta and then pour the clam mixture on top. Stir well and serve immediately.